Humanitarian workers believe the worst is yet to come as the Israeli military continues to intensify its air attacks. The wave of violence began on Wednesday with a rocket attack on the vehicle of Ahmad Jaabari, a senior figure in the autonomous region’s administration. Jaabari, his son and his driver were killed in the attack. Since then, aerial bomb raids have pounded the strip while an ominous massing of Israeli ground forces has taken place at the border -- just as in 2009, when a previous invasion resulted in the death of thousands of innocent civilians. A token response by the Hamas government has included rockets fired towards Tel Aviv, and has been seized upon by Israel as offering justification for their attacks. The official spokesperson for the Israeli Defence Forces issued a message to Gazans to say: “You Opened Hell Gates on Yourselves”. The population of Gaza has lived in crisis since 2007, when Israel began implementing a blockade to prevent the importation of essential items. The streets are now evacuated, and food and medicines are in extremely short supply. 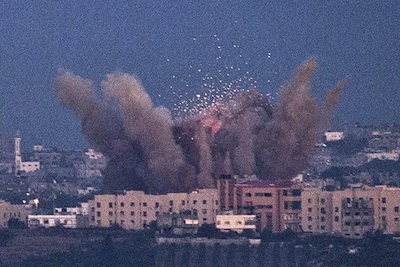 With the massacre of the 2009 invasion still strong in people’s minds, the horror of hourly bombardment by Israel’s ‘Operation Pillar of Cloud’ has created a sense of apocalyptic doom. Fikr Shallpoot, a programme manager with the London-based Medical Aid for Palestinians, says supplies are now a growing problem. “There is [at least] 165 drug items that are now at zero stock at the moment,” she said, adding that blood banks are also very low. While their influence over the mainstream media has again been evident in the current crisis, internet social networks have undermined Israel’s propaganda machine for the first time. Accounts of “targeted” strikes by the Israeli Air Force against Al-Qaeda-supporting extremists have been countered by direct images of the atrocity. They have confirmed that 14 of the 22 fatalities of the bombardment and hundreds who have been injured so far have been civilians -- among them seven children and a pregnant woman. Three Israelis were killed by a rocket on Thursday. Despite Israeli efforts to cut off internet access, reports of the bombardment from inside Gaza have become widely available and have fuelled spontaneous protests in almost every major city worldwide, including Dublin, Cork, Limerick and Belfast. Sinn Fein President Gerry Adams TD has called on both sides in the escalating conflict to call an immediate cessation of all armed actions. Around 100 people led by members of the Ireland Palestine Solidarity Campaign (IPSC) gathered outside the Israeli embassy in Dublin on Thursday night, hoisting a massive Palestinian flag. A sit-down protest on the road outside the building prompted a heavy-handed Garda response, with some police using their batons to club protestors. Events are also taking place this evening, and culminate in a larger protest at the Spire in Dublin at 2pm tomorrow -- see https://ipsc.ie for details.